Perfect Week to Renew Your Membership + Our First-Ever Music Video! I’m Ted Walter, director of strategy and development at AE911Truth. I’m reaching out to you because we discovered that your annual or quarterly membership donations recently stopped processing — either because the credit card on file expired or because of some other change in your information. Fortunately, this is the perfect time to renew your membership. For the final week of our ongoing 2016 Membership Drive, a very generous donor has stepped forward and promised to match EVERY new membership between now and Sunday! So, for example, if you renew at our most popular level of $7.50 — whether you give monthly, quarterly, or annually — our matching donor will double your membership by donating $90 ($7.50 x 12). Sign up at the $12.50 level and he’ll give $150, and so on. Our members are the lifeblood of this organization. Renew your membership this week, and you’ll help us twice as much. Together we’ll make this our most impactful year ever. This is also a big week because we just released our first-ever music video. It’s called FREE FALLIN’ starring BUILDING 7. Have a listen and you’ll recognize the tune. This video is yet another step in our new strategy of producing short, entertaining video content with the goal of expanding our audience by millions of people. But we’re also kicking off something that will spread our message even further! Between now and this year’s 9/11 anniversary, we’re inviting supporters all over the world to record their own versions of FREE FALLIN’ starring BUILDING 7 — either using our lyrics or writing new ones. 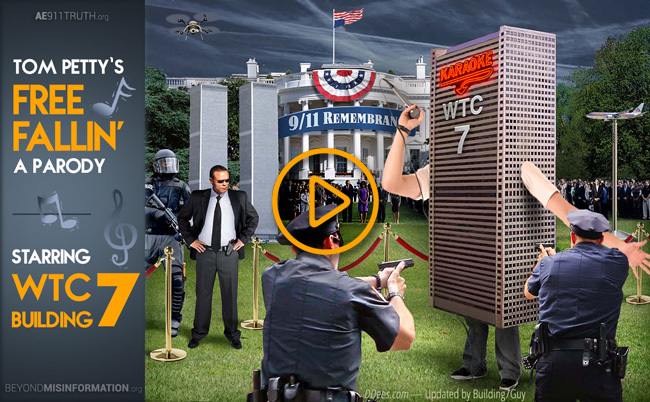 Our goal is to make this powerful song a vehicle for achieving widespread awareness of Building 7 in 2016. Send your version to FreeFallin@AE911Truth.org and we’ll post it on our channel. Of course, if you’re less musically inclined, you can help just as much by sharing the video with people in your circles. We at AE911Truth are profoundly grateful for your longstanding support, and honored to be working with you to expose the most important truth of our time. Thank you for all that you do.